No information about the constitution of this chapel, that is the biggest of the cloister. At the end of 15th century this chapel belonged to Lisolo Fajboli.One of the two span was sacrificed to build the stairway that get to the Episcopio. The entrance is characterized by two lowered archs, unloaded on the little central column, covered by paintings of the 17th century with angels and skulls proving the sepulchral function of the place. The inner part is partially covered by an ornament of the same period, appear, on the little cross vault, angels that have marian attributes and, on the shutter of the recess, Saint Joseph and an Annuncer Angel. It is evident that this paints have, in large part, covered more ancient representations that appear from the underlying level of plaster: only the Announcer Angel is visible of the frontal wall, related to 14th century, which certainly contrast an Annuncer Virgin today hidden by the bricklaying. The Chapel takes the name by the fresco with Crucifixion that covers completely the ogive wallon the left. The work has been attribute by consent to Roberto d’Oderisio, artist trained into Neapolitan Giottesque environment and mentioned by the king of Naples, Carlo III from Durazzo, as proto-painter of the court in 1382, as successful completion of the long and virtuos career. The Crucifixion, crowded by the multitude of hooded character, by soldiers on horseback and by sufferes, is characterized also by the precense of two croucifixed thieves. It is related to the first activity of the master, justifying the executive uncertainty of spatial layout. No information about the constitution of this chapel, that is the biggest of the cloister. At the end of 15th century this chapel belonged to Lisolo Fajboli. One of the two span was sacrificed to build the stairway that get to the Episcopio. The entrance is characterized by two lowered archs, unloaded on the little central column, covered by paintings of the 17th century with angels and skulls proving the sepulchral function of the place. The inner part is partially covered by an ornament of the same period, appear, on the little cross vault, angels that have marian attributes and, on the shutter of the recess, Saint Joseph and an Annuncer Angel. 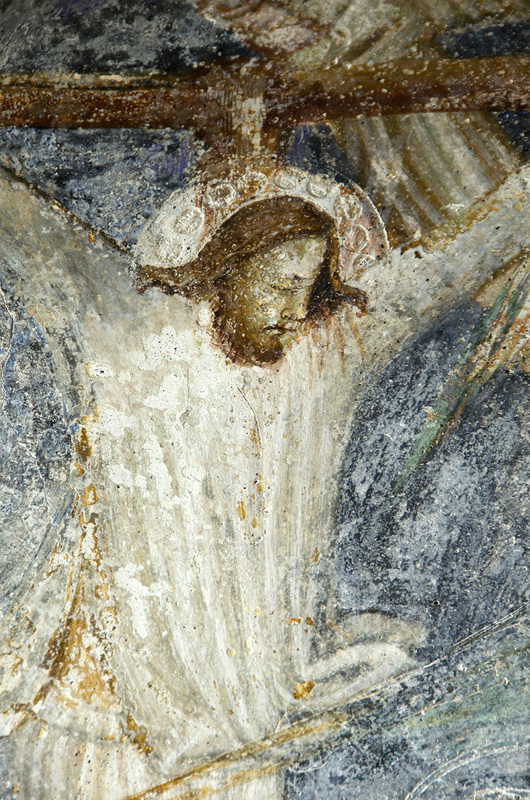 It is evident that this paints have, in large part, covered more ancient representations that appear from the underlying level of plaster: only the Announcer Angel is visible of the frontal wall, related to 14th century, which certainly contrast an Annuncer Virgin today hidden by the bricklaying. The Chapel takes the name by the fresco with Crucifixion that covers completely the ogive wallon the left. The work has been attribute by consent to Roberto d’Oderisio, artist trained into Neapolitan Giottesque environment and mentioned by the king of Naples, Carlo III from Durazzo, as proto-painter of the court in 1382, as successful completion of the long and virtuos career. The Crucifixion, crowded by the multitude of hooded character, by soldiers on horseback and by sufferes, is characterized also by the precense of two croucifixed thieves.